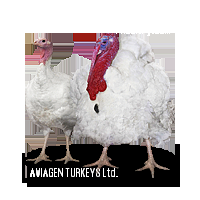 Aviagen Turkeys is the premier supplier of turkey breeding stock worldwide, supporting the world-class brands of B.U.T. and Nicholas. We provide our customers with choice, presenting an extensive product portfolio. Unique among turkey primary breeders, Aviagen Turkeys is a truly global supplier, with pedigree breeding programs in the USA (Aviagen Turkeys, Inc.) and Europe (Aviagen Turkeys, Ltd.). Multiple breeding programs and production centres provide a more secure, global supply source and the opportunity to maximize product improvement and new product development. Aviagen Turkeys utilizes innovative technologies and maintains diverse genetic lines to enable selection of turkeys that give the best performance in a wide range of environments. Investment and innovation are key to product development, producing the turkeys of the future. Heavy strain products are ideally suited to portioned, further processed and value-added product markets. Medium strain products have the flexibility to supply whole bird, portioned, and further processed markets, whilst satisfying reproductive requirements.